JP 2007-01-09 600 points ? US 2006-12-11 600 points ? EU 2006-12-15 600 points ? AU 2007-07-06 600 points ? This short article is in need of work. You can help NEC Retro by adding to it. 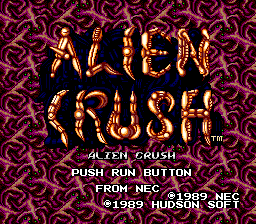 Alien Crush (エイリアンクラッシュ) is a pinball game developed by Naxat Soft and released for the PC Engine in 1988 (before subsequently seeing a 1989 TurboGrafx-16 release in North America). Alien Crush was followed by Devil's Crush, also released on NEC's systems, and Jaki Crush for the Super Famicom. A remake was also released for the Wii's WiiWare service as Alien Crush Returns. Main article: Alien Crush/Magazine articles. This page was last modified on 23 December 2018, at 05:34.